Desert Sage Auxiliary of Assistance League® Las Vegas, will distribute its “one millionth” Pocket Book in February 2019. 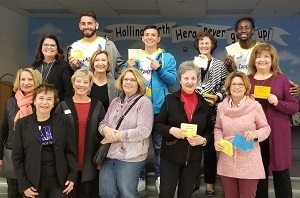 To celebrate this milestone, Desert Sage participated in a special event at Hollingsworth Elementary School on Friday, February 8, 2019. 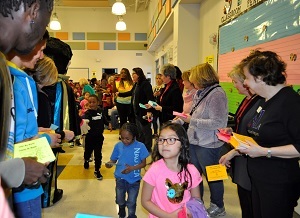 Members of the Las Vegas Lights soccer team were invited to the school to kick-off a school-wide reading contest where the students will receive tickets to LV Lights games for reaching their reading goals. 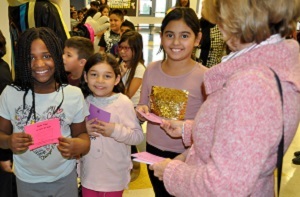 Upon leaving the assembly, all the primary students (grades K-2) received a new Pocket Book to take home, handed out by Lights Players, Angel Alvarez, Thomas Olsen, Alex Nyarko Harlley and Desert Sage members. Pocket Books are original bilingual books, written and illustrated by Desert Sage members. From its inception in 2003, the Pocket Book program has grown to include 18 copyrighted titles in three (3) separate series – story books, concept books (focusing on the alphabet, colors, numbers and shapes) and an early reader series which includes simple words and repetition. In the past year, Desert Sage Auxiliary distributed 70,300 books to 131 schools with 65% or more students qualifying for the free and reduced lunch program. Pocket Books are distributed to at-risk schools with the goals of enhancing a child’s personal library and encouraging a love of reading within the family. The Desert Sage Pocket Book program was awarded the Crystal Bookmark Award at the 2018 Las Vegas Book Festival. The Pocket Book program was recognized for promoting reading and literacy and providing books for children from underserved populations.